Here’s her announcement & fabulous theme! I’m excited to be hosting RRC #8: Retro Wobbles But It Won’t Fall Down. This time around we will be making food that wiggles and wobbles. Think aspic, Jell-O salad, gelatin parfaits, jelly candies or even jam. The only catch? You have to use a recipe that was first published before 1985. 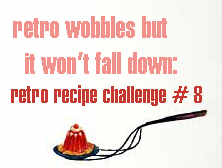 For help in finding a recipe, check out the “helpful links” sidebar on the Retro Recipe Challenge blog. Once you’ve created your dish, post a picture of the finished product, along with the recipe and your review to your blog or flickr account. Don’t forget to include the year the recipe was first published and its source. Please attach a photo (no larger than 100×100 pixels) and include “RRC#8” in the subject line. The round-up will posted by August 12th on Food Maven and the Retro Recipe Challenge Blog.